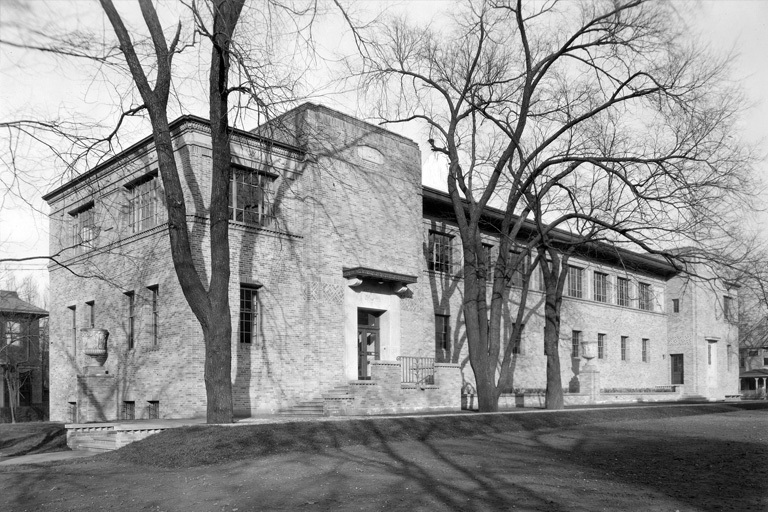 Herron School of Art and Design started as a private school in 1902, and those roots still grow today at the urban campus of Indiana University–Purdue University Indianapolis (IUPUI). The more you explore Indianapolis, the more you will recognize Herron's integral role in shaping our surroundings. You will discover the footprints of Herron students, alumni, and faculty all over the city — in galleries, classrooms, boutiques, museums, businesses, design firms, and cooperative artist studios across town. It is this trailblazing spirit and the prestige of an Indiana University degree that attracts students to Herron each year. Herron continues to do what it has always done: teach aspiring artists how to develop and hone their skills, channel their talents, and make art that evokes emotions, provokes thought and invokes ideas. The original location of John Herron Art Institute at 16th and Pennsylvania streets. IUPUI University Library Special Collections and Archives. © 2002-2004. The Trustees of Indiana University. 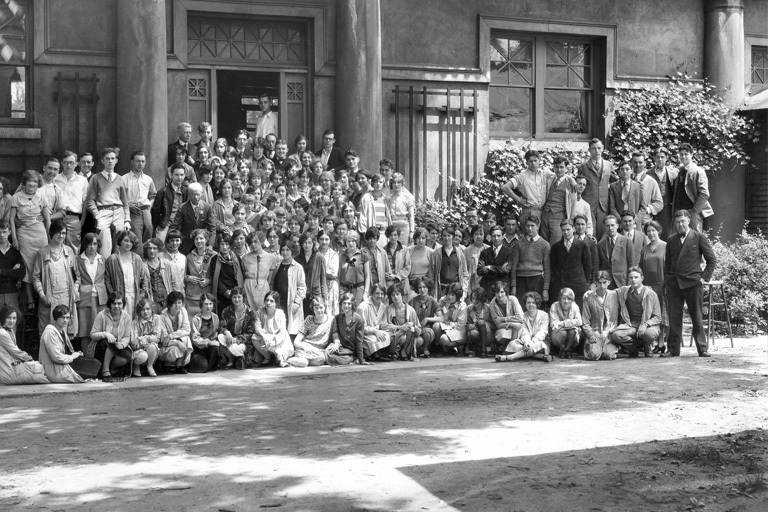 Herron's graduating class of 1928. IUPUI University Library Special Collections and Archives. © 2002-2004. The Trustees of Indiana University. 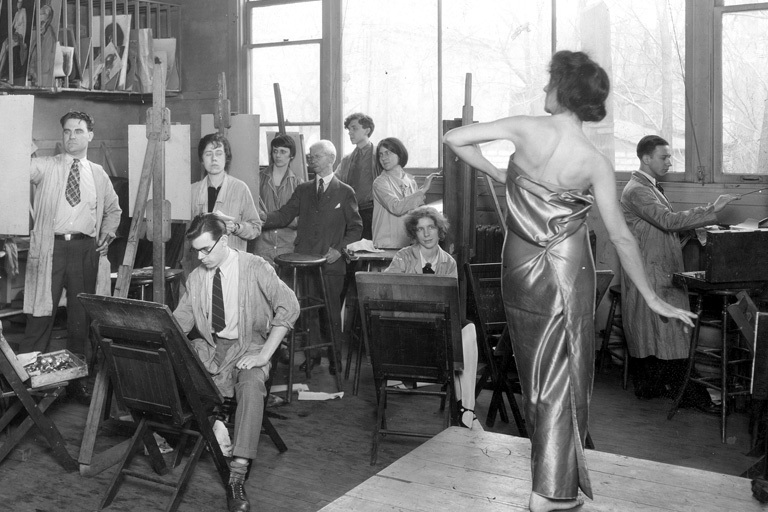 Herron students drawing an elegantly-draped life model in 1927. IUPUI University Library Special Collections and Archives. © 2002-2004. The Trustees of Indiana University. 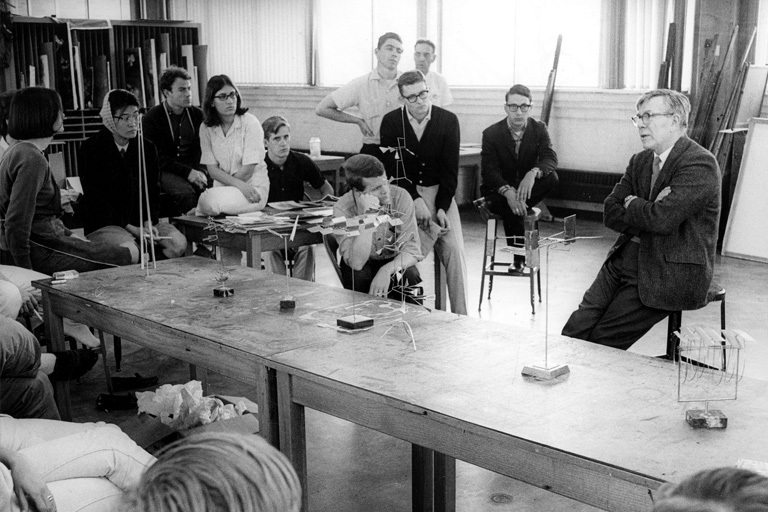 Internationally renowned kinetic sculptor George Rickey speaking to Herron students in 1965 about his professional art practice. IUPUI University Library Special Collections and Archives. © 2002-2004. The Trustees of Indiana University. 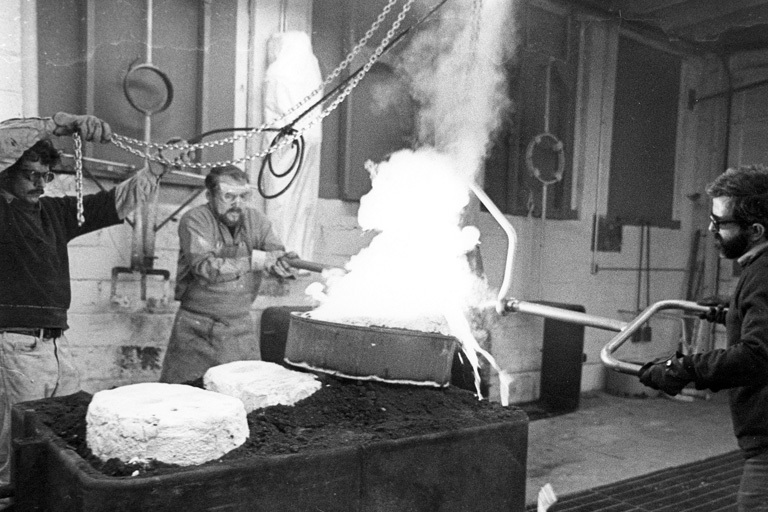 Sculpture professor Gary Freeman firing up Herron's new foundry in 1970. IUPUI University Library Special Collections and Archives. © 2002-2004. The Trustees of Indiana University. 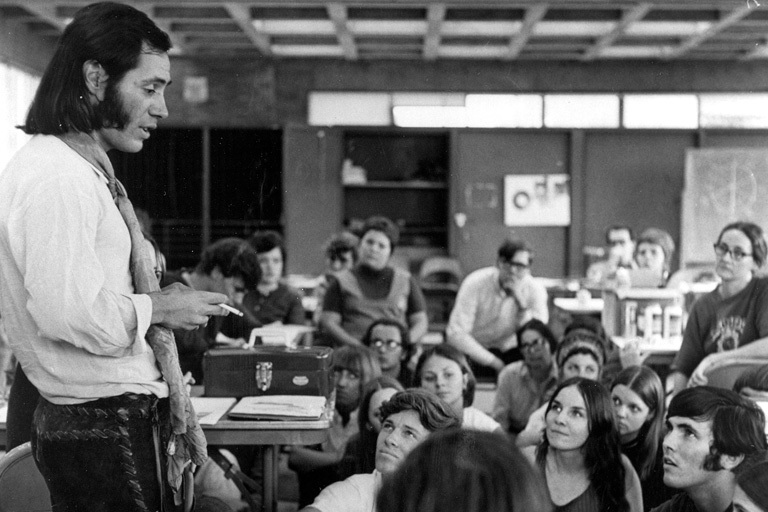 Claude Picasso, self-taught photographer and son of Pablo Picasso, visiting Herron in 1970. IUPUI University Library Special Collections and Archives. © 2002-2004. The Trustees of Indiana University. Herron springs to life as the John Herron Art Institute, a private art school and museum located at 16th and Pennsylvania streets. Herron joins the National Association of Schools of Art and Design (NASAD), a newly formed accrediting body. The museum separates to become the Indianapolis Museum of Art while the school joins Indiana University. Two years later, Herron and other professional schools are united to establish the IUPUI campus. Herron moves to its new buildings adjacent to the museums of White River State Park and the Indianapolis Cultural Trail. The Basile Center for Art, Design and Public Life is established as a hub for career development and connecting Herron talent with community partners. Think It Make It Lab is established to promote the creative use of new technologies and provide a collaborative environment for research, experimentation, and innovation. The work of Herron students, faculty, and alumni has marked the Indianapolis landscape for more than a century. The school’s civic engagement starts at home, but extends well beyond the Midwest to far-flung places. Indiana's state flag was designed by former Herron faculty member Paul Hadley and officially adopted in 1917. The city’s centerpiece, the Soldiers and Sailors Monument on Monument Circle, features sculpture work by former Herron faculty member Rudolf Schwarz. Herron alumnus Rik Tommasone designed the Lilly Medal, awarded biannually to the recipient of the Indianapolis Prize – the world’s leading award for animal conservation, given by the Indianapolis Zoo. Internationally known artist and Herron alumnus Don Gummer created “Southern Circle” for the Meridian Street Plaza, a park-like setting in front of Rolls-Royce Meridian Center.